American International Pictures (AIP) was a film production company formed in April 2, 1954 from American Releasing Corporation (ARC) by James H. Nicholson, former Sales Manager of Realart Pictures, and Samuel Z. Arkoff, an entertainment lawyer. It was dedicated to releasing independently produced, low-budget films packaged as double features, primarily of interest to the teenagers of the 1950s, 1960s, and 1970s. Nicholson and Arkoff formed ARC in 1954; their first release was the 1955 The Fast and the Furious. Nicholson and Arkoff served as executive producers while Roger Corman and Alex Gordon were the principal film producers and, sometimes, directors. Writer Charles B. Griffith wrote many of the early films, along with Arkoff's brother-in-law, Lou Rusoff, who later produced many of the films he had written. Other writers included Ray Russell, Richard Matheson and Charles Beaumont. Floyd Crosby, A.S.C. famous for his camera work on a number of exotic documentaries and the Oscar winner, High Noon, was chief cinematographer. His innovative use of surreal color and odd lenses and angles gave AIP films a signature look. The early rubber monster suits and miniatures of Paul Blaisdell were used in AIP's science fiction films. The company also hired Les Baxter and Ronald Stein to compose many of its film scores. In the 1950s the company had a number of actors under contract, including John Ashley, Fay Spain and Steve Terrell. AIP was the first company to use focus groups, polling American teenagers about what they would like to see and using their responses to determine titles, stars, and story content. AIP would question their exhibitors (who often provided 20% of AIP's financing:35) what they thought of the success of a title, then would have a writer create a script for it. :156 A sequence of tasks in a typical production involved creating a great title, getting an artist such as Albert Kallis who supervised all AIP artwork from 1955–73 to create a dynamic, eye-catching poster, then raising the cash, and finally writing and casting the film. to catch your greatest audience you zero in on the 19-year old male. Having recognized that other filmmakers were ignoring the lucrative teenage drive-in market, AIP focused on producing scores of low-budget, youth-oriented films released as double features. They exploited the emerging juvenile delinquent genre with movies like Daddy-O, High School Hellcats, Female Jungle, Reform School Girl, Runaway Daughters, and Girls in Prison. Many of AIP's "wild youth" features also catered to the teenage obsession with cars and drag racing in films such as Hot Rod Gang, Hot Rod Girl (with Chuck Connors), Roadracers, Dragstrip Girl, and the 1959 horror-hybrid Ghost of Dragstrip Hollow – the sequel to 1958's Hot Rod Gang. Movies centered on rock 'n roll music such as Shake, Rattle & Rock! and Rock All Night were another untapped area mined by AIP. But one of their most unusual innovations was the creation of teen-themed horror films with eye-catching titles like: I Was a Teenage Werewolf (starring Michael Landon), I Was a Teenage Frankenstein, and Roger Corman's science fiction film Teenage Cave Man, with Robert Vaughn. AIP also capitalized on the popularity of war films with releases such as 1958's Tank Battalion, starring Edward G. Robinson, Jr., backstopped by a bevy of female nurses and barmaids in case the combat scenes failed to interest moviegoers. Made as usual on a very tight budget, the costs of casting meant that the producer could only afford the rental of a single tank for the so-called 'Tank Battalion', and the action scenes were written with this limitation in mind, focusing primarily on the tank's crew and their love interests. Science fiction and horror films, many directed by Roger Corman and written by Lou Rusoff, were a staple at AIP with titles like It Conquered the World (with Peter Graves and Lee Van Cleef), The She Creature, and War of the Colossal Beast. Before that they were on poverty row. Our better position will enable us to obtain more important writers, perhaps more important producers as well. We're a privately owned company at the moment but perhaps within two or three years we will become a public company. Beginning with 1963's Beach Party, AIP created a new genre of beach party films featuring Annette Funicello and Frankie Avalon. The original idea and the first script were Lou Rusoff's. The highly successful and often imitated series ended in 1966 with the 7th film, The Ghost in the Invisible Bikini. Many actors from the beach films also appeared in AIP's spy-spoofs such as Dr. Goldfoot and the Bikini Machine (1965) and car racing sagas like Fireball 500 (1966) and Thunder Alley. During this time AIP also produced or distributed most of Roger Corman's famous horror B movies, including such films as X: The Man with X-Ray Eyes, The Raven, and The Terror. In 1966, the studio released The Wild Angels starring Peter Fonda, based loosely on the real-life exploits of the Hells Angels motorcycle gang. This film ushered in AIP's most successful year and kicked off a subgenre of motorcycle gang films that lasted almost ten years and included Devil's Angels, The Glory Stompers with Dennis Hopper and The Born Losers—the film that introduced the Billy Jack character. In 1968 AIP launched a $22 million film program. The psychedelic and hippie scenes of the late '60s were also exploited with films like The Trip, also with Peter Fonda, Riot on Sunset Strip, Wild in the Streets, Maryjane, Gas-s-s-s, and Psych-Out with Jack Nicholson. These "social protest" films were also highly successful. Horror movies also enjoyed a revival of popularity in the late 60s. In the United Kingdom, AIP struck up a film making partnership with Nat Cohen and Stuart Levy's Anglo-Amalgamated. On a trip to Italy, Arkoff met Fulvio Lucisano, an Italian screenwriter and producer who eventually headed Italian International Film, which co-produced 25 films in Italy for AIP. The "International" in American International Pictures presumably lived up to its name. Due to importing completed productions from other foreign countries being cheaper and more simpilistic than producing their own in-house studio films in America, AIP had released many giallo, sword and sandal (or "peplum)", Eurospy and Macaroni Combat war films featuring many American stars and Italian stars such as the comedy team of Franco Franchi and Ciccio Ingrassia. However, AIP released no spaghetti westerns, perhaps recalling their failure of Westerns in the 1950s. Many of these films were edited, rewritten with different (dubbed English) dialogue, usually by Arkoff's nephew Ted Rusoff, and sometimes rescored by Les Baxter. AIP through Henry G. Saperstein is well known for being the major U.S. distributor for Toho's Godzilla and Daiei's Gamera (kaiju) movies of the '60s and '70s. AIP also distributed other Japanese science fiction movies like Frankenstein Conquers the World, Monster from a Prehistoric Planet, and the South Korean production Yonggary, Monster from the Deep as well as two Japanese animated features from Toei Animation, Alakazam the Great and Jack and the Witch. AIP also released a pair of Japanese spy thrillers redubbed as a comedy co-written by Woody Allen called What's Up Tiger Lily?. The studio also released edited and English-dubbed versions of several Eastern Bloc science fiction films, that had the dialogue rewritten for the American market and in some cases had additional scenes filmed with American and British actors. These include the Soviet film Planeta Bur (Planet of Storms) which was released by AIP in two different English-dubbed versions, as Voyage to the Prehistoric Planet and Voyage to the Planet of Prehistoric Women and the highly regarded 1963 Czech science fiction film Ikarie XB-1, which was retitled Voyage to the End of the Universe. In the early 1960s, AIP gained some kudos by combining Roger Corman, Vincent Price and the stories of Edgar Allan Poe into a series of visually impressive horror films, with scripts by Richard Matheson, Charles Beaumont, Ray Russell, R. Wright Campbell and Robert Towne. This series of movies made AIP an American counterpart to the British studio Hammer Films and its famous Hammer Horror line featuring Peter Cushing and Christopher Lee. The original idea, usually credited to Corman and Lou Rusoff, was to take Poe's story "The Fall of the House of Usher", which had both a high name-recognition value and the merit of being in the public domain, and thus royalty-free, and expand it into a feature film. Corman convinced the studio to give him a larger budget than the typical AIP film so he could film the movie in widescreen and color, and use it to create lavish sets as well. The success of House of Usher led AIP to finance further films based on Poe's stories. The sets and special effects were often reused in subsequent movies (for example, the burning roof of the Usher mansion reappears in most of the other films as stock footage) making the series quite cost-effective. All the films in the series were directed by Roger Corman, and they all starred Price except The Premature Burial, which featured Ray Milland in the lead. It was originally produced for another studio, but AIP acquired the rights to it. As the series progressed, Corman made attempts to change the formula. 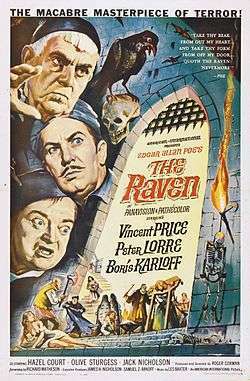 Later films added more humor to the stories, especially The Raven, which takes Poe's poem as an inspiration and develops it into an all-out farce starring Price, Boris Karloff and Peter Lorre; Karloff had starred in a 1935 film with the same title. Corman also adapted H. P. Lovecraft's short novel The Case of Charles Dexter Ward in an attempt to get away from Poe, but AIP changed the title to that of an obscure Poe poem, The Haunted Palace, and marketed it as yet another movie in the series. The penultimate film in the series, The Masque of the Red Death, was filmed in England with an unusually long schedule for Corman and AIP. The film, inspired by Ingmar Bergman's The Seventh Seal, looks much more opulent than the rest of the series. Many critics agree that this film is the best in the "Poe Cycle." Although Corman and Lou Rusoff are generally credited with coming up with the idea for the Poe series, in an interview on the Anchor Bay DVD of Mario Bava's Black Sabbath, Mark Damon claims that he first suggested the idea to Corman. Damon also says that Corman let him direct The Pit and the Pendulum uncredited. Corman's commentary for Pit mentions nothing of this and all existing production stills of the film show Corman directing. Of eight films, seven feature stories that are actually based on the works of Poe. Occasionally, Corman's 1963 film The Terror (produced immediately after The Raven) is recognized as being part of the Corman-Poe cycle, although the film's story and title are not based on any literary work. A few years later, AIP backed a British Poe film directed by Gordon Hessler: The Oblong Box (1969) based on the short story of the same name. In 1964, AIP became one of the last film studios to start its own television production company, American International Productions Television (a.k.a. American International Television or AIP-TV). AIP-TV at first released many of their 1950s films to American television stations, then filmed unsuccessful television pilots for Beach Party and Sergeant Deadhead. The company then made several colour horror/science fiction television movies by Larry Buchanan that were remakes of black-and-white AIP films, and sold packages of many dubbed European, Japanese, and Mexican films produced by K. Gordon Murray and foreign-made live-action and animated TV series (including Prince Planet). The best known animated series AIP-TV distributed was Sinbad Jr. and his Magic Belt. In order to allay the fears of cinema owners who feared current releases would soon end up being shown on television, AIP issued a statement retroactive to 1963 that the company would not release any of their films to television until five years after cinema release unless the film had not made back its original negative costs. AIP-TV also filmed specials of promotion of AIP films such as The Wild Weird World of Dr. Goldfoot (1965, ABC) and An Evening of Edgar Allan Poe (1972, syndication), both with Vincent Price. In 1978, AIP-TV distributed the pop music series Twiggy's Jukebox. For several years around this time, AIP-TV also distributed several British TV series, including The Avengers, to U.S. stations. AIP started their own record label, American International Records in 1959 to release tunes used in their movies. There were a number of soundtrack albums as well. AIP Records was once distributed by MGM Records, the record label owned by AIP's successor-in-interest MGM. In 1969 AIP went public to raise extra capital, issuing 300,000 shares. In 1970 they entered into an agreement with Commonwealth United Productions to issue their films. In 1971 they released 31 films, their greatest number to date, and were seen as one of the most stable companies in Hollywood. Despite their exploitation roots they did not concentrate on X or R rated filmmaking during this period. In 1972 James H. Nicholson resigned from AIP to set up his own production company working out of 20th Century Fox, called Academy Pictures Corporation; its only two releases were The Legend of Hell House and Dirty Mary Crazy Larry. AIP bought out over 100,000 of Nicholson's shares. He died shortly thereafter of a cancerous brain tumor. Arkoff continued on at AIP as president until the end of the decade. Heads of production during the 1970s included Larry Gordon and Jere Henshaw. By the early 1970s AIP felt the horror movie cycle was in decline, and so switched to other genres, such as kung fu and gangsters. Notably they produced some of that decade's blaxploitation films like Blacula, and Foxy Brown. In a throwback to the old "studio days", the company is credited with making Pam Grier a household name, as the majority of her early '70s films were made under contract to American International. In the mid to late 1970s, AIP began to produce more mainstream films such as Bunny O'Hare, Cooley High, The Great Scout & Cathouse Thursday, The Amityville Horror, Love at First Bite, Meteor, Force 10 from Navarone, Shout at the Devil, The Island of Dr. Moreau and C.H.O.M.P.S. The increased spending on these projects, though they did make some money, contributed to the company's downfall. In the meantime, the studio imported and released its final foreign film, an Australian film, Mad Max, dubbed into American English. James Nicholson's first wife Sylvia was still a major shareholder of the company. She sued AIP for mismanagement but this was resolved in 1978 when AIP bought out her shares. By the late 1970s costs of making movies continued to rise, AIP's tactic of moving into bigger budgeted quality pictures was not paying off at the box office, and Arkoff began to think of merging the company. "We've been the Woolworths of the movie business but Woolworths is being out priced," said Arkoff. Talks began with Filmways Incorporated. Negotiations stalled for a while but resumed a number of months later. In 1979 AIP was sold to Filmways, Inc. for $30 million and became a subsidiary production unit thereof renamed Filmways Pictures in 1980. Arkoff was unhappy with the direction of the company and resigned to set up his own production company, receiving a pay out worth $1.4 million. AIP-TV was absorbed as the wholly owned program syndication arm of Filmways Television. Filmways was later bought by Orion Pictures Company in 1982 and Filmways was later renamed to Orion Pictures Corporation, but retained the distribution arm. This allowed Orion to establish its own distribution after utilizing Warner Bros. for distribution which still has distribution rights to Orion films Warner distributed. Today, a majority of the AIP library is owned by Metro-Goldwyn-Mayer's subsidiary Orion Pictures Corporation. The American International name is still a registered trademark owned by MGM's Orion Pictures unit. November 1956 Shake, Rattle & Rock! June 19, 1957 I Was a Teenage Werewolf Horror Gene Fowler Jr.
June 1960 Why Must I Die? July 5, 1962 Panic in Year Zero! October 27, 1965 Die, Monster, Die! April 1966 What's Up, Tiger Lily? May 1969 God Forgives... I Don't! March 15, 1972 Whoever Slew Auntie Roo? May 1975 What Have You Done to Solange? April 1, 1977 Breaker! Breaker! June 1978 Who Can Kill a Child? ↑ Shocker Pioneers Tell How to Make Monsters: Want to Make a Monster? Experts Tell How It's Done Scheuer, Philip K. Los Angeles Times (1923-Current File) [Los Angeles, Calif] September 17, 1958: E1. ↑ Samuel Z Arkoff Biography, Fancast . 1 2 3 Doherty, Thomas (1988), Teenagers and Teenpics, Unwin-Hyman . ↑ Booker, M. Keith. Historical dictionary of American cinema. Lanham, Md. : Scarecrow Press. p. 22. ISBN 0-8108-7192-0. ↑ Albert Kallis – bio, Learn about movie posters, archived from the original on 2008-03-21 . ↑ Who Needs High Salaried Stars? Horrors! Film Makers Find Audiences Prefer Action Alpert, Don. Los Angeles Times (1923-Current File) [Los Angeles, Calif] 15 July 1962: A8. ↑ AIP Reveals Its 1968 Film Program Los Angeles Times (1923-Current File) [Los Angeles, Calif] 13 Jan 1968: b7. ↑ "International Secret Police". tokyo street report. 2009-04-16. Archived from the original on 4 July 2010. Retrieved 2010-08-02. ↑ Billboard – Google Books. 1959-06-08. Retrieved 2010-08-02. ↑ "American International Records – CDs and Vinyl at Discogs". Discogs.com. Retrieved 2010-08-02. ↑ "Together/AIR Album Discography". Bsnpubs.com. 2000-04-12. Retrieved 2010-08-02. ↑ American International Pictures Enters Film Accord Wall Street Journal (1923 - Current file) [New York, N.Y] 10 Apr 1970: 22. ↑ 30 FEATURES SET: AIP ANNOUNCES PLANS FOR BUSIEST FILM YEAR Warga, Wayne. Los Angeles Times (1923-Current File) [Los Angeles, Calif] 28 Jan 1971: g11. ↑ Nicholson to Quit American International Pictures Post Wall Street Journal (1923–Current file) [New York, N.Y] 17 January 1972: 18. ↑ California Film Maker Buys Own Stock From Ex-Officer Wall Street Journal (1923–Current file) [New York, N.Y] 19 September 1972: 43. 1 2 The dime-store way to make movies-and money By Aljean Harmetz. New York Times (1923-Current file) [New York, N.Y] 04 Aug 1974: 202. ↑ Policy Shift Set by American International Pictures Inc. Wall Street Journal (1923 - Current file) [New York, N.Y] 25 May 1972: 7. ↑ American International Pictures Buys Shares From Sylvia Nicholson Wall Street Journal (1923 - Current file) [New York, N.Y] 19 Apr 1978: 36. ↑ American International Pictures, Filmways Inc. Terminate Merger Plan By a WALL STREET JOURNAL Staff Reporter. Wall Street Journal (1923 - Current file) [New York, N.Y] 11 Dec 1978: 20. ↑ May Revive Merger Talks With Filmways, AIP Says Jones, John A. Los Angeles Times (1923-Current File) [Los Angeles, Calif] 12 Feb 1979: d12. ↑ Filmways Says Assets Were Overstated For American International Pictures Inc. By a WALL STREET JOURNAL Staff Reporter. Wall Street Journal (1923 - Current file) [New York, N.Y] 03 Dec 1979: 8. ↑ AIP BITES DUST AS FILMWAYS RENAMES STUDIO Los Angeles Times (1923-Current File) [Los Angeles, Calif] 13 Mar 1980: f3. ↑ President of Filmways' American International Pictures Resigns Post Wall Street Journal (1923 - Current file) [New York, N.Y] 06 Dec 1979: 30. ↑ How Accountants Helped Orion Pictures Launch Its Financial Comeback Welles, Chris. Los Angeles Times (1923-Current File) [Los Angeles, Calif] 15 May 1983: f1. 1 2 Grand Guignol Set at Vine St. Cabaret: Huston 'Sells' Kipling Yarn; Sinatra, AIP Think Young Scheuer, Philip K. Los Angeles Times (1923-Current File) [Los Angeles, Calif] 12 July 1963: D11. 1 2 AIP Millions for Poe, Beach Parties: 'Flowers' Oscar Hopeful; Burton Buys, May Direct Scheuer, Philip K. Los Angeles Times (1923-Current File) [Los Angeles, Calif] 02 Jan 1964: C11. ↑ Hollywood To Make A Big Silent Film." Times [London, England] 3 Mar. 1965: 15. The Times Digital Archive. Web. 15 June 2014. ↑ Howard Hughes, Aide Part Company Dorothy Kilgallen:. The Washington Post, Times Herald (1959-1973) [Washington, D.C] 11 June 1964: E22. ↑ American Film Executive On Study Visit South China Morning Post & the Hongkong Telegraph 15 Sep 1965: 7. ↑ MOVIE CALL SHEET: Spiegel to Film 'Swimmer' Los Angeles Times (1923-Current File) [Los Angeles, Calif] 19 Mar 1965: D13. 1 2 3 American International Expanding Operations Los Angeles Times (1923-Current File) [Los Angeles, Calif] 04 May 1966: e13. ↑ American International Pictures' Profit Steady: Company Says Results for Third Fiscal Quarter Were About the Same as for Year-Ago Period Wall Street Journal (1923 - Current file) [New York, N.Y] 12 Oct 1971: 37. ↑ American International Pictures Wall Street Journal (1923 - Current file) [New York, N.Y] 09 May 1973: 19. ↑ American International Will Be 'Happy' if Net Matches Fiscal 1975's Wall Street Journal (1923 - Current file) [New York, N.Y] 27 Oct 1975: 18. ↑ AMERICAN INTERNATIONAL EPIC: CHINESE BOOK U.S. FILM 'FUTUREWORLD' Bry, Barbara. Los Angeles Times (1923-Current File) [Los Angeles, Calif] 05 Jan 1979: d16. Mark Thomas McGee, Faster and Furiouser: The Story of American International Pictures (McFarland & Company, 1995) ISBN 0-7864-0137-0.